Live With It was established twenty eight years ago by Lora Hobbs as a small, tidy gift shop in Northeastern Pennsylvania (the Scranton/Wilkes-Barre area. Lora possessed a B.A. in Literature, a Secondary Education Teaching Certificate, substantial experience in the set-up/management of restaurants and catering operations, two adorable young daughters and one husband, who (although supportive) did not want to be involved. Interestingly, Lora had an uncanny eye for color and design, a tireless work ethic and an unquenchable desire to create a job for herself while improving the quality of life for her young family. The concept was simple: SERVICE and GIFTS---all kinds of Gifts---Gifts for the Home, the Table, the Office and the Bride; Gifts for Birthdays, Anniversaries and the new Baby; Gifts for Christmas, St. Patrick’s Day and Easter; inexpensive Gifts and expensive Gifts---but every Gift, all the Gifts, were wrapped and delivered as needed free of charge. Live With It patrons would walk out the door, proud as a peacock, with a wonderfully wrapped and always reasonably priced Gift. To this day, all bridal registry gifts are delivered or displayed free of charge ... and Dave, the reluctant to be involved husband, came on board to help with the growing business. Today, Live With It is regarded by many as Northeastern Pennsylvania’s premier Gift Store and is consistently voted “Best Bridal Registry” location. We specialize in Tabletop, Decorative Accessories for the Home, Seasonal Gifts and extraordinary Bridal Registry services. An amazing array of both Classic and New/Trendy Dinnerware Patterns and Glassware/Flatware Coordinates by industry giants as well as boutique comers are always beautifully shown. 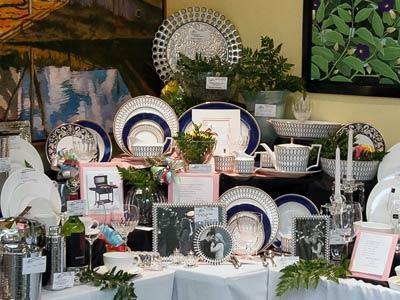 In addition our seasonal giftware displays for Spring, Summer and the Holidays are often described as spectacular. Live With it is still owned and operated by Lora and Dave Hobbs---and we are never idle, never stale, always up to date and usually available---on premises seven days a week and some evenings to assist with the simplest Birthday Gift or help select a complex suite of Corporate Christmas Gifts. In addition, we love to work with and register our Brides. It keeps us young. So…PLEASE, don’t just click through this site. Call or come and see us anytime. You won’t be sorry.